Sports Legends was the brainchild of former England and Lancashire cricketer Ian Austin. 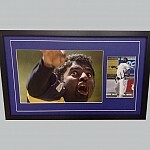 So when it comes to cricket memorabilia, you can imagine it's an area closest to our heart. Authenticity is always at the heart of sports memorabilia, and it's no different with signed cricket memorabilia - you have to know the signature is real. Having an ex-England cricketer on the team tends to help. Ian played with (or against) some of the people on these pages. When you have that sort of relationship to the memorabilia you sell it's a lot easier to be assured of its authenticity. 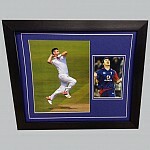 From England heroes to legends of the world game, we're proud of the quality of our signed cricket collectibles. So whether your collection needs a contribution from Andrew Flintoff or Andrew Strauss, or a signed photograph of Brian Lara or Shane Warne, you'll find better sports memorabilia - at better prices - here. We're fans too. That's why we care passionately about our cricket memorabilia. It's why we offer an expert framing service to protect your authentic cricket memorabilia and create a brilliant display piece. 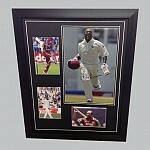 It's also why we keep our prices low, so every fan has a chance to own their perfect piece of cricketing history. Add to your collection. Give it as a gift. Treat it as an investment. Whatever you plan to do with your signed cricket collectibles, find a better choice - and the best value - at Sports Legends.